BEAVERS may once more become the basis on which all furs are valued if experiments now being conducted by the National Parks branch of the Canadian government are successful. Once the coin of the realm, beavers became so scarce that today no white man may trap them in the Dominion, and Indians may do so only in limited areas. Beaver fur is scarce, where once it was the standard on which all fur dealings were based. 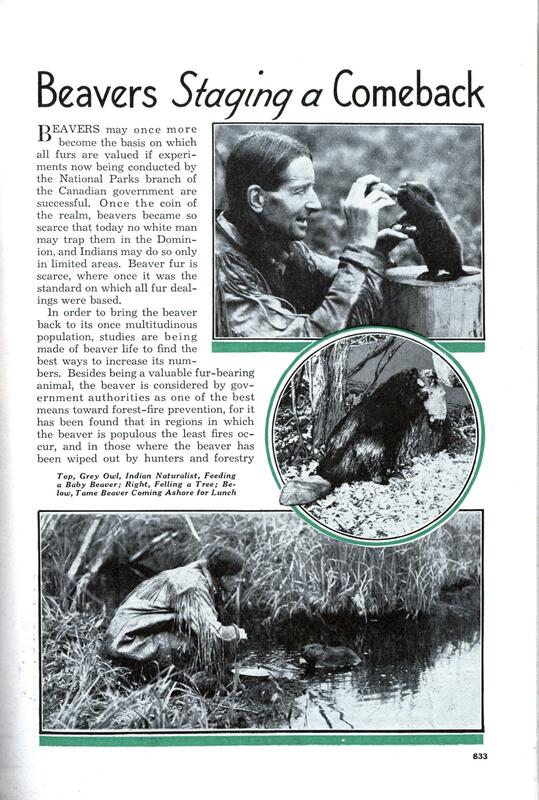 In order to bring the beaver back to its once multitudinous population, studies are being made of beaver life to find the best ways to increase its numbers. Besides being a valuable fur-bearing animal, the beaver is considered by government authorities as one of the best means toward forest-fire prevention, for it has been found that in regions in which the beaver is populous the least fires occur, and in those where the beaver has been wiped out by hunters and forestry operations, the greatest fire hazard is to be found. A half-breed Indian named Grey Owl has been made the official doctor and nurse of the beaver. He goes to the various parks of the government where the beaver is found in some numbers and then studies the habits of the animal. He has made friends with the beavers wherever he has gone, so that they come to him at his call, invade his house, and become attached enough for him to find out what foods besides twigs and leaves they like best and which are most nourishing. He has gone so far in this study, that where he has found orphaned beaver kittens he has fed the youngsters from a bottle and even a syringe, giving them milk diets. As they grew older he fed them boiled rice, apples, and other foods not found in the woods. The beavers fed in this way have thrived. Grey Owl has learned also that the animals can be transported from one section of the country to another without harm. He has on several occasions taken them with him in boxes in his canoe, and on wagons and trains. Other experiments have shown that beavers brought up from kittens on special foods and kept in a tank in a cottage for the winter will in summer go back to the streams and the woods, to fell trees, build dams and lead their natural life. Grey Owl’s activities as guardian of the beavers include the breeding of strong virile colonies. Through trapping, the interbreeding among some of the colonies has weakened their resistance to weather and other animals. In such cases beavers from vigorous colonies are brought in to strengthen the weaker groups. The noted naturalist Grey Owl lived in Saskatchewan’s Prince Albert National Park during the 1930’s and worked for the Dominion Park Service. He was one of the first true promoters of natural conservation. He wrote books and produced films. He was much revered by the public because he was an Indian. In fact Grey Owl was not a Cree as he often claimed. His real name was Archibald Stansfeld Belaney and he was born in Hastings, England. As a boy, he fantasized of a different way of life, one far from his urban existence in England. In 1906, he immigrated to Canada. At first he lived in Northern Ontario as a trapper. But after meeting Gertrude Bernard he gave up trapping beaver and became their most ardent supporter. Most famously he lived one year with a beaver family – allowing them to “nest” in his cabin. The guy must have been committed – live beavers smell horrible, like rancid fat. His cabin is now a National Historic Site and you can still smell the stench. For some reason tourists from Japan flock to visit the site. Beavers are the best! They are my spouse’s school mascot and mine is a lumberjack. That just further proves we were meant for each other! We collect beaver items and watch for evidence of them at our local parks and wildlife areas. They truly are an unappreciated animal that does much to keep the forest in balance. Yes. I remember being especially interested in beavers at high school.